Distressed Floral Jeans by Waiquiri. Distressed floral jeans are your next springtime staple inspired by the tropic essence of Waiquiri. Designed with an all-over, subtle floral and palm pattern. Constructed with front and back pockets and belt loops along waistband. Distressed floral jeans feature a stone wash look with whiskered creases on thighs. Fashioned with metal button-up fly and dark back pocket embroidery. Bottom hems are lightly frayed for a worn denim effect. Channel some serious surfer-chic style in the distressed floral jeans. 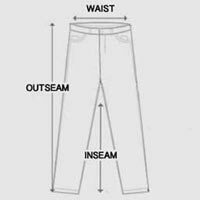 Model is wearing size 28. For accurate measurements, check the table below.